Congratulations! 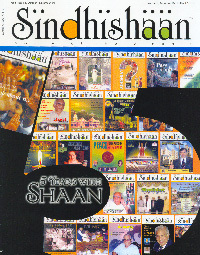 I still vividly remember when Sindhishaan was launched. It's already five years !! We, in fact, need to express our gratitude to you for having attempted such a bold step. Your recent issue covering my humble contribution to the society has come out very well and I would like to thank you for thinking of me and giving such an extensive account in your prestigious publication.